Yesterday evening I snuck out between the rain showers to walk the dog through the neighborhood. It has been a while since I’ve been out, and it’s not just because of the weather. Besides admiring the flourishing lawns, blooming flowers and flowing streams, I was floored by the extraordinary amount of new construction. Folks have been busy this spring building on formerly vacant lots or demolishing older houses to create something entirely new – not a remodel or expansion, but brand new. The styles ranged from neo-classical to post-modern, with grand multi-story and split level homes rubbing shoulders with the more modest frame houses that have been in Tarrytown for decades. The first thing that occurred to me was how few of these new projects had come before WANG. To me, that means that the construction complies with the City’s Land Development Code and with the Neighborhood Plan. Generally, land use matters only come before WANG if the owner needs some variance from the Code to proceed with their project. The most frequent variances include building into setbacks, exceed the floor-to-area ratio (FAR), which is .40 per the McMansion ordinance, or exceeding the impervious cover limit of 45%. Most times, the first thing we ask anyone is whether they’ve checked with their neighbors about their proposed variance. WANG is very concerned about the potential impact of proposed construction on those neighbors most affected. As a matter of interest, WANG also learns of demolition permits, but we have limited input into whether or not the demolition will go forward unless, of course, the property has historic significance. While I didn’t take out a tape measure, I’m confident that every new home I saw on my walk last night was larger, often significantly larger, than the “tear-down” it replaced. I don’t know whether this is the type of urban infill envisioned by City Hall. I suspect that one effect of newer, larger homes in our zip code has the effect of increasing property values – a suspicion borne out by the valentine we all received from the tax appraisal office last month. According to the Statesman, property values in our neighborhood increased an average of 12% across the board. Although not the highest in town, the jump in valuation means that it’s more and more expensive to live in Tarrytown. Finding a way to have affordable housing in Tarrytown, as well as in other central Austin neighborhoods, seems more elusive than ever. WANG has been successful in giving voice to neighbors about some new projects, such as the proposed new condo development at 3215 Exposition. WANG supported the neighbors’ fight for eight years, opposing a multi-family zoning designation. Ultimately, we were able to convince the City to approve a single-family zoning with significantly fewer units, less height and less mass than the developer proposed. This project is a great example of WANG working with neighbors and property owners to find a middle ground that all can live with. The future of the remainder of the tract adjacent to this property, the home of the Austin State Supported Living Center (formerly the Austin State School), is still in flux, though its closing appears probable. There are two bills affecting the ASSLC: a Senate bill that has been passed, and a companion bill in the House, HB 2699, which has been pending before the Human Services Committee since March 23. With little time left in this Legislative session, it is unclear whether the legislation will proceed. The bill proposes closing the facility in 2017, at which time all or part of the tract would likely be sold or leased for redevelopment. WANG is closely monitoring this issue and is prepared to move proactively and will be seeking your engagement when the time comes. As another example of community input, the initial District 10 boundary proposed by the Austin Independent Citizens Redistricting Commission (ICRC) stretched along MoPac in a narrow district that extended from Lady Bird Lake to Pflugerville. Based on neighborhood concerns about this proposal (including extensive input at our neighborhood Annual Social), WANG and the Central West Austin Neighborhood Plan Contact Team advocated before the ICRC to get a more compact district much closer to the final District 10 boundaries. WANG welcomes input at our monthly board meetings, communicates with neighbors to solicit their input and opinions, and bases any decisions or votes based on the input we receive as well as our own experiences as neighbors, property owners, residents, or tenants. For example, WANG’s variance and zoning request function (which is designated by city ordinance) is implemented by seeking input from the property owner seeking the variance/zoning change and also from the nearby affected neighbors who are all invited and welcome to attend our board meetings before any decision is made. My walk last night reminded me of a posting I saw on a neighborhood blog a couple of months ago. The writer was under the mistaken impression that WANG, and neighborhood associations in general, impose restrictions on an owner’s use of their property. In the ether of cyberspace, it’s difficult to explain to someone how far in left field their belief is. So, I’ll say it here. WANG can’t enforce any rules, nor can we create or implement any rules. We are not a legislative body. Our decisions on requested variances do not control the final question. Instead, WANG’s position is included in the City’s decision process before boards and council as one of several stakeholders. This process is designed to bring local knowledge into the City’s decision-making. WANG has been successful in representing our neighborhood’s interests as a reasonable voice representing an active and involved neighborhood. Our primary role, really, is to give voice to neighbors’ concerns about the neighborhood, whether that is a new building, construction noise, or preserving green space (such as Lions Municipal Golf Course). We’re here for you. What’s going on with MoPac? I’ve watched the progress of the improvements to MoPac, from Hwy 183 to the river with curiosity and concern. Curiosity because of the engineering feats as TxDOT carves out new space through Austin’s central core, especially through our neighborhood, and with concern for the increased traffic that will pour into downtown through the interchange at Cesar Chavez, Fifth Street, and Lake Austin Boulevard. I have heard assurances that the new managed lanes will not actually increase capacity, but I have a hard time understanding how you can build more lanes without adding cars, even if those additional lanes come at a cost to drivers. The good news is that the sound walls are beginning to go up – you can see some of the first ones between Enfiled and 5th Street on the east side of MoPac, and it appears that the project is on track to be opened by the end of the year. More environmental damage to Barton Springs/Edwards Aquifer recharge zone. Weigh in at the Virtual Open House now through April 2, 2015 at www.mopacsouth.com/voh/. The proposed improvements raise significant environmental concerns. The new construction will run across the Edwards Aquifer recharge zone and Lady Bird Lake. It also lays the groundwork for a proposed extension of SH 45 along the southwest side of the city. Basically, SH 45 SW, Phase 2, as proposed, will connect I-35 to MoPac South, making MoPac the primary route through Austin rather than I-35. You can find maps of the entire loop at keepmopaclocal.org. The proposed improvements to MoPac, both north and south of the river, and the extension of SH 45 SW, have been unveiled piecemeal. No transportation authority has conducted any overarching study of the environmental impact or whether these proposals will actually improve anyone’s commute. The MoPac south extension will shorten the commute for those willing to pay a toll to drive on the managed lanes, but it will only shorten the commute for the non-paying commuters at the most by 20 minutes in 2035 for those driving all the way in from Slaughter Lane. Is this really worth the $330 million price tag? More locally, expanding MoPac through the central corridor will have the greatest impact on downtown neighborhoods which will also benefit the least. On my daily evening commute from downtown, I rarely take MoPac, opting instead to drive through Old Enfield, Pemberton and Tarrytown. As congestion increases, spillover from MoPac will continue to flow through our neighborhood streets. Exposition Blvd. is already stop and go from Lake Austin Blvd. to 35th St., and Scenic is seeing an uptick as well. At the Open House held at O’Henry MS on March 4, 2015, the CTRMA representatives didn’t have many answers for us, but gave assurances that public input is ongoing, and that the proposals are only the first pass at the alternatives available. Of primary concern is the additional traffic dumping onto Cesar Chavez adjacent to Austin High, forcing neighborhood kids to cross several lanes of traffic to get to school. Another issue for our neighborhood is the proposed flyover from MoPac to Cesar Chavez and 5th Street. Solutions to Austin’s traffic woes are few and far between. If we do nothing, congestion is sure to get worse. If we spend lots of money on new roads and expansions of old ones, we’ll still have more and more cars. There’s no guarantee that the proposed expansions will still be workable by the time 2035 rolls around. The Katy Tollway on I-10 West in Houston is a sober reminder – it opened in 2009, and it’s already at failure during rush hour. The only real solution is to change our behavior. Ride your bike, take the bus, car share. Do something other than drive solo in your car to work. This month, I started taking the bus to work and signed up with car2go to cover unexpected trips. I hope to keep it up long-term, but I haven’t given up my parking spot in my building. Yet. Brides will be able to use their Target registry app and click away on all of the items they love. Wanna know the best part? Each bride will receive a $25 gift card as they enter and another $25 gift card as they leave. Yep, you read that right!! Maybe this is what the City had in mind when it passed the STR ordinance. www.austintexas.gov/str. While the stated purpose of the ordinance is to regulate “vacation rentals” of less than thirty days, nothing in the ordinance specifically prohibits the type of use Target had in mind when it rented its Deep Eddy venue space. And heck, it’s a lot cheaper to rent a house for a few days than it would be to reserve a space at the W. And the parking is free! Except it wasn’t so great for the neighbors. The day before the event, moving vans pulled up in front of the house to unload “all things Target,” as well Custom paint the interior of the house, set up as outdoor canopies and add extra lighting. Notice the Target logo hanging above the scene in the photo above, like a shining star in the East? And it wasn’t over when the last bride collected her exit gift card — not by far. Not only was there a huge load-out, but there were enormous piles of garbage to contend with. To be fair, it was all taken away and cleaned up within a couple of days, but getting there was no small feat, and the ordeal created a significant intrusion upon the nearby residents. When the STR ordinance was passed, lots of folks complained that it was one more level of bureaucracy that would stifle the free-flowing creativity of its residents. Cynics noted that the ordinance imposed yet more taxes (the $285 licensing fee as well as payment of hotel taxes) to line City coffers. Many argued that we didn’t need any regulation or inspection of vacation rentals, and they claimed that the real impetus behind the ordinance was larger hotel chains who feared additional competition from websites like Airbnb or HomeAway. Whole websites sprang up devoted to circumventing the ordinance (no. 1 tip—don’t advertise on Craigslist). WANG was heavily involved in the passage of the ordinance. Before the STR ordinance was adopted, any short-term rental in a residential neighborhood was not permitted under the City’s Land Development Code. WANG opposed the adoption of the STR ordinance, or as an alternative, called for more City oversight than was included in the final ordinance. While we didn’t envision neighborhood retail outlets, we have been concerned about commercial ventures purchasing homes as an investment to be used only as an STR – effectively a bed and breakfast on every residential corner. This means that guests without ties to Austin, and particularly no ties to our neighborhoods, would float in and out non-stop. This transient population reduces the housing stock and means there’s one less family to contribute to the fabric of our neighborhood. The City Council didn’t see it our way, and they adopted an ordinance that specifically recognizes STRs that are not owner-occupied, such as the site of the Deep Eddy extravaganza. The prospect of full-blown hospitality suites popping up in our neighborhoods during SXSW, ACL and Formula 1 is downright alarming. These festivals already turn our streets into traffic nightmares – for several years Deep Eddy has a hotline for reporting parking issues associated with ACL. This expanded interpretation of an accepted and allowable use of STRs will move entertainment venues into residential areas with an open guest list, like Target’s. In fact, Target actually paid folks ($50/bride) to show up and add items to their registry and provided valet parking. Some investors have purchased all the houses on a single cul-de-sac, opening the way for even larger commercial group rentals. Clearly, this type of use is not what anyone at City Hall had in mind when the STR ordinance was enacted. So, now’s the time to let our newly elected District representative, Sherri Gallo, know your thoughts on the subject. You can reach her at District10@austintexas.gov. You can also weigh in with the rest of the Council, since this is sure to be a city-wide problem. West Austin Neighborhood Group President Cathy Kyle is ceding her usual President’s Message to the following except from an article providing some insight into possible solutions to our traffic woes. Gridlock in the state’s major urban areas is worsening every year. Meeting this challenge will require solutions on both sides of the supply-and-demand equation. On the supply side, Texas took a significant step in 2011 when the Texas Legislature directed the Texas A&M Transportation Institute (TTI) to serve as coordinator for state and local agencies in helping implement construction projects for the most congested Texas corridors. The Mobility Investment Priorities study identified those needs and helped to determine how to get the biggest return on the investments legislators had appropriated. Actions such as this are an essential part of the solution, but this problem cannot be solved through new construction alone. Another essential part involves the concept of travel demand management, which attempts to get the most efficient possible use from the current system. That can take a number of forms — transit, ride-share programs, bicycle and pedestrian options, park-and-ride programs and work pattern changes. A number of these innovative ideas are already making a positive difference in Texas. Systems in several cities feature high-occupancy vehicle, high-occupancy toll lanes, managed lanes and toll roads. The time- and cost-saving benefits in Houston, for example, have led to the emergence of casual carpooling, in which passengers meet at locations close to HOV facilities, and drivers pick up enough passengers to meet HOV requirements and avoid a toll. In Austin, another program began in 2013 with the introduction of Carma, a real-time ride-sharing option. Interested commuters download the app, find nearby matches and reduce the number of single-occupant vehicles, one carpool at a time. In El Paso, iCarpool software supports ride-sharing actions by helping participants identify route information, pick-up and drop-off locations and time preferences, and also by offering an emergency ride home provision. Carpooling is nothing new, of course, but apps such as Carma and iCarpool demonstrate how modern technology can offer new solutions to a not-so-new problem. Texans can also look to other states for best practices that have potential here. One example is telework, which refers to arrangements that allow employees to work from home or other locations on a regular basis. State employees participating in the Telework Arizona program avoided about 5.2 million miles of vehicle travel and 180,000 hours of commute time in one year alone. In Georgia, if state employees participate in the Work Away program at least once a week, they can eliminate 416,000 trips and 5.4 million miles of vehicle travel annually. In addition to their trip-reduction benefit, programs like these offer a win-win by boosting morale for employees who appreciate flexibility, and by giving employers a significant recruiting and retention strategy to attract and keep top talent. To be successful, strategies like these call for the involvement of business as well as government. Since the early 20th century, Texans have relied on the public sector to meet their transportation needs. State and local agencies assumed the exclusive role of building, maintaining and operating our highway system. That model was sufficient for its time. But the challenges are different today, so the approach to those challenges must also be different. For travel demand management to be an effective and successful strategy, its purpose and approach must be embraced by both the public and private sectors. Apart from all these potential solutions, is “doing nothing” an option? Certainly it is, but like all the other available options, it involves a predictable cost. Doing nothing means Texans will spend more time stuck in traffic. They will spend more money on wasted fuel and will spend more on just about everything that’s delivered by trucks. Texans will also face the prospect of slower emergency response times. Doing nothing is an option, but it’s not a cost-free option. For decades, Texans have enjoyed a legacy of quality roads. But for a variety of reasons — many of them positive in their own right — that legacy is now threatened, largely because of growth. And more growth is on the way. The state demographer projects the state’s population to be 28.9 million in 2020, up from 25.2 million in 2010. By 2030, Texas will add four million more. All those new people will need places to live, so the state demographer’s projections certainly foretell a robust real estate environment. But those Texans will also need streets and highways to the recreation and leisure activities that largely define their quality of life. And with travel demand outstripping roadway supply at a steadily growing pace, future prosperity and quality of life both grow more uncertain. What is certain is that there is no single solution to this problem. Carpooling and telework are choices that only some may find to be practical. Not all commuters have access to public transit. New construction will help, but it would be impossible to simply build our way out of congestion. The right approach will involve a mix of all the available tools, along with getting the most efficient possible use from the available transportation system. That all-of-the-above approach offers the best hope of bringing our transportation supply-and demand equation into better balance. Gooding (g-goodin@tamu.edu) is a senior research engineer at the Texas A&M Transportation Institute and the director of TTI’s Transportation Policy Research Center. We’re looking forward to our Annual Picnic, which will be held at Tarrytown Park on Sunday, October 19 from 11 am-1 pm. We’ll have burgers (including veggie burgers) by P. Terry for purchase, and you will be able to join or renew your membership in WANG. It’s always a great opportunity to re-connect with old friends and meet new neighbors. The room was full last weekend as neighbors from all parts of West Austin gathered to hear District 10 candidates at a forum hosted by West Austin Neighborhood Group, Highland Park/Balcones West Neighborhood Association and Brykerwood Neighborhood Association. Although District 10 stretches from Lady Bird Lake past Northwest Hills and beyond Loop 360, the central Austin neighborhood groups joined forces to host an event focusing on the issues that matter most to us. By all accounts, it was the best-attended forum to date. Kudos to August Harris and Dawn Lewis for their leadership in planning the event, and our heartfelt thanks to Westminster Manor for allowing us to hold the even in the newly renovated Bell Harris Hall. All eight candidates showed up for the forum: Margie Burciaga, Tina Cannon, Mandy Dealey, Sheri Gallo, Matt Lamon, Jason Meeker, Robert Thomas and Bill Worsham. The topics included emergency services; city staff’s discretion in interpreting plats, notes and deed restrictions when granting building permits; the role of Neighborhood Plans in the revision to the City’s land development code in the CodeNEXT process; protecting and promoting historic neighborhoods; the future of the Brackenridge Tract, Lions Municipal God Course, and the Austin State School Living Center; and their positions on the McMansion and Heritage Tree ordinances as well as other compatibility standards. While all the candidates pledged to vote against Proposition 1, the $1 billion transportation bond that will also be on the ballot come November, each had different ideas for solving Austin’s transportation woes. For more information about each candidate’s position, visit projects.statesman.com/databases/city-council-districts. And by all means, go vote! Early voting begins October 20, and the general election will be held November 4. See you at the polls! Although it seems ages ago, as a gift to my husband for Father’s Day way back in June, I agreed to tear out the turf in our front yard in favor of xeriscaping. Naturally, we began the work before investigating the City’s rebate program. If xeriscaping is in your future, check out these guidelines to help pay for the project: austintexas.gov/department/waterwise-landscape-rebate. Not coincidentally, I think, my dearest began the project on a weekend that I was out of town, and I returned to a lawn that was in shreds, too far gone to have any second thoughts. Fortunately, our neighbor across the street needed additional turf after installing a new driveway, so our grass was replanted immediately. So why xeriscape? After receiving several inches of rain this week, the drought of 2009 seems a distant memory. Certainly, it will be years before we ever recoup the cost of our xeriscaped installation, even though we’ve done all the work ourselves and despite savings on our water bill. Regardless, the fact remains that according to the Austin Business Journal, and estimated 110 people move to the Austin area every day, and no one’s expecting that number to decline. By some accounts, each Austinite uses over 8,000 gallons of water per month, so you can see that the demand for water will continue to grow exponentially. My husband bemoaned the irony of watering the grass only to have to mow the lawn, a never ending-cycle of increased water use which created more work. Xeriscaping seems a rather obvious way one way to minimize our water usage. An unexpected surprise, however, has been our neighbors’ positive responses to the change. While we were tearing out turf and spreading crushed granite and rock in the hot June sun, several folks stopped to ask about our plans and to give encouragement. Now that the fall planting season has arrived, we’ve started filling the space with flower beds full of perennials and succulents. Our hope is that the plantings will be well-established in time for spring blooms. Miss Ruth turned 92 last month. She leads the seniors program at my church, and she directs the seniors’ choir. She also leads a Sunday School class as well as a couple of other discussion groups, and she’s active in the women’s mission group. She may be the most active and alert woman of her age that I’ve ever met. Recently, I learned that her son is a resident at the Austin State Supported Living Center (ASSLC), and she’s kept track of developments at the facility, including rising criticism of the ASSLC. She listens, and responds that her family’s experience there has been only positive. Miss Ruth’s defense of the ASSLC is echoed by many family members who have reached out to WANG in the wake of the Sunset Advisory Commission Staff Report recommending that the ASSLC, as well as five other SSLC’s across the State, be closed. Family members contend that the ASSLC provides a warm, nurturing community for their loved ones, and they argue passionately in support of the ASSLC. This is not the first time that the State has examined the ASSLC tract as a lucrative revenue source. In 2005, the Texas Department of Health and Human Services (DHHS) conducted a feasibility study for closure of the supported living centers, which at the time were called “State Schools.” www.hhsc.state.tx.us/contract/529140066/docs/attachment-C.pdf. In conjunction with that feasibility study, WANG conducted a survey asking for neighbors’ opinion of the value of the ASSLC to the neighborhood. At that time, the vast majority of the respondents favored keeping the ASSLC open. WANG submitted two letters providing input to the marketability assessment, which first emphasized the inherent conflict between considering marketability without considering the needs of the residents. We also considered the fate of the ASSLC when we created the West Austin Neighborhood Plan and the Future Land Use Map. In particular, we noted the role of the ASSLC in our community. It provides space for our children to play soccer, meeting space for neighborhood organizations, and green space for our neighborhood. Again, our neighborhood weighed in in favor of keeping the ASSLC open, continuing its role in our community and providing much-needed services to its residents. In the 2005 report, the DHHS noted the steady increase of individuals with developmental disabilities in the overall population as well as the increased life span of this group, suggesting an increased pressure on the existing service system, community and institutional, to meet these needs. The report implicitly acknowledged an enormous unmet need, although the ASSLC was operating at near funded capacity – meaning that the Legislature has chosen to limit funding for beds in an institutional setting, despite the unmet need and the facility’s capacity. More recently, AARP reported that Texas ranks third worst nationally in providing services to the aging and disabled. www.texastribune.org/2014/06/19/report-shows-texas-lagging-long-term-care-quality. It should come as no surprise, then, that the Sunset Review Advisory Commission report recommends closure of the ASSLC by January 2017. After all, the facility sits on an expensive piece of real estate located in the heart of central Austin, within a stone’s throw of the proposed transit center at Mopac and 35th Street, as envisioned by Project Connect. austinhomemapsearch.com/wp-content/uploads/2013/11/High-Capacity-Transit-Vision.pdf. And the State has a demonstrated pattern of failing to adequately fund services for individuals with developmental disabilities. The report runs through a litany of problems with the ASSLC, including the fact that it has achieved only 20% compliance with a settlement agreement with the US Department of Justice (DOJ). Also, ASSLC has been operating under a moratorium for several years, meaning that it has not accepted any new residents. Its population has been slowly declining. According to the Sunset Review Committee’s report, in Fiscal Year 2013, the ASSLC had 308 residents and a staff of 1,236. The Sunset Advisory Committee strafed the ASSLC, characterizing it as an outmoded method of providing services to those with developmental disabilities, calling it inefficient, expensive, out of regulatory compliance, and bordering on criminal. www.sunset.texas.gov/reviews-and-reports/agencies/department-aging-and-disability-services-dads. And what was the Department of Aging and Disability Service’s response to the closure recommendation? The administrative equivalent of agreeing to go quietly: “DADS [Dept. of Aging and Disability Services] supports the goal of serving people with intellectual disabilities in the most integrated setting, consistent with the choices of those individuals and their guardians. Recognizing that permanently closing a center would be a difficult decision, DADS is committed to providing timely, accurate information to the Legislature as it considers this issue.” Not even a whimper — and certainly no information provided to advocate for the needs of the residents, no effort to identify its capacity for serving even more individuals, and no articulation of the value of the services provided. www.sunset.texas.gov/public/uploads/~DADS%20Agency%20Response.pdf. At last week’s hearing before the legislative subcommittee, healthcare professionals, families and residents lined up to tell their stories. Commission Chair Sen. Jane Nelson queried the staff as to why they had recommended closure of six of the thirteen supported living centers operated across Texas. When they could articulate no reason for choosing that particular number, Nelson speculated that the Commission might not accept the recommendation to close all six facilities, but she was pretty confident that the Austin facility would not remain open. So, how does Miss Ruth’s son fit in this picture of neglect and even abuse? The advisory report claims that the standard of care has shifted to community-based programming, offering that recent research indicates that individuals with intellectual and developmental disabilities’ needs are better met in group homes. It does not, however, take into account the effect of abruptly moving these individuals from a familiar setting and dropping them into a completely different environment, nor does it consider the effect on families, who have worked to insure that their family members in need of care receive services in an atmosphere of which they approve and in a location that allows families to remain in contact. The State has long underfunded services for this group of its citizens. The staff report provides no evidence that the specific individuals presently residing in the ASSLC will be better served in group homes There is no promise that the State will provide funding to increase the number of individuals served in order to make a real attempt at meeting the unmet needs of this growing group. Instead, the report focuses on the substantial savings to be realized by closing the ASSLC and selling the property. Also, the State has been unable to satisfy the DOJ’s mandates, failing to adequately fund and provide the necessary resources to fix the ASSLC. If the residents are shuttled off into the diaspora of group homes, will they have greater regulatory oversight? Will they receive the same level of service delivered at the ASSLC, or even better, the level of service that they need and deserve? Neither the Sunset Commission nor DADS offer any assurance that these vulnerable individuals will be better served in group homes than they have been at the ASSLC or that the State will step up to meet its obligations to them. And that is disturbing. The staff report also fails to take into consideration the vacuum left in our neighborhood by the closure of the ASSLC. The soccer fields, the green space, the volunteer opportunities, the meeting space – all will be gone. And in its place? Mixed use development, which is not a terribly enticing vision for our neighborhood’s future. Overall, the staff report is shortsighted and biased. The imminent opening of the medical school at UT Austin provides an opportunity for the ASSLC that should not be ignored. In partnership with UT, DADS could develop a state of the art facility at the ASSLC to better provide services to its residents. Further, the numerous historically significant buildings on the campus could be re-purposed, either for the ASLC itself, for the medical school, or for other state needs. Selling the property off to the highest bidder and shuttling the residents to other facilities or group homes, away from friends, family and familiar surroundings, is a myopic and ultimately harmful response. In March, August Harris described the CodeNEXT process that the City is using to re-write the Land Development Code, a harbinger of ways to increase density in our neighborhoods without considering the neighborhood plans adopted only recently. Last month, I described a local developer’s success in convincing Council Members Riley and Spelman that multi-family zoning would be acceptable transitional zoning from a deed-restricted one-story single family neighborhood on Exposition. Fortunately, the neighbors and WANG were able to thwart that zoning application, and SF6 won the day. The push for density, however, does not end. The newest iteration are micro-units, a new way to impose density without regard for existing planning and zoning considerations. On June 12, the Austin City Council will consider a resolution to consider allowing “accessory dwelling units” that are less than 500 square feet. In the name of increased urban density, the resolution will reduce minimum lot size, increase allowed impervious cover, increase maximum height, and eliminate parking and driveway requirements for micro-units This proposal will take place outside of the Code NEXT process. Council Members Riley and Spelman call for these micro-units in existing and future Transit Oriented Development districts (for example, 35th St and MoPac) and to eliminate minimum site area requirements. Also, even legally non-compliant structures could add a micro-unit if located on a lot with sufficient area. The proposed resolution does not limit micro-units to multifamily zoning categories. A micro-unit ordinance would eliminate VMU’s requirements that affordable housing be a condition of increased entitlements and that nearby neighborhoods have expedited residential permit parking. This completely undermines the affordable component of VMU. Riley and Spelman countered that eliminating the parking requirements would make apartments more affordable by not requiring residents to pay for a parking space. Riley added “It will provide an opportunity to avoid having a car.” Or, it will provide an opportunity for micro-unit residents to park their cars on the street. And really, how affordable will even a 500 sq. ft. unit be in west Austin? The land values alone make true affordability next to impossible. Riley and Spelman’s resolution to study micro-units is the first step in an attempt at an end run on our neighborhood plan and the limits of secondary units in SF3 for lots over 7,000 sq. ft. The proposal comes before the CodeNEXT process has addressed how to protect neighborhood character as reflected by neighborhood plans as the City re-writes the Land Development Code. The push for micro-units is yet another play to increase density in central Austin neighborhoods without any consideration for the additional burden on our aging infrastructure. You might also consider how such zoning entitlements will impact our skyrocketing property taxes. Let the Council know of your concerns before the June 12 meeting. Back in the ‘70’s, my family would often drive on the Dallas-Fort Worth Turnpike, as it was known colloquially. It seemed exotic to my young understanding – paying to drive on a road that seemed better than a run-of-the-mill highway. We all knew that someday, the turnpike would be paid for and then we would be able to travel between downtown Dallas and downtown Fort Worth for free. That day came in 1977, when the bonds were finally paid off and the toll booths were taken down. Now, the turnpike is nothing more than a 30-mile stretch of I-30 linking the two cities. And it’s still free. The notion of creating a turnpike authority and issuing municipal bonds to pay for a transportation corridor seems quaint in this day and age, when the primary solution to every transportation problem is to build another toll road, outsourced to a private multi-national corporation. I recently traveled to north Dallas and was stunned by the crisscrossing toll roads named after ex-Presidents that seemed to go nowhere. The idea that the tolls will one day end after the roads are paid for has long been abandoned. After all, we have to pay to maintain the roads, don’t we? Private toll companies regularly overestimate usage when selling the toll road project to local municipalities, and when the revenues fall short, those same companies shift the blame, and the risk, to the cities themselves. Last fall, it was widely reported that usage on SH130 fell far short, and revenues were 55% less than originally forecast. Originally, proponents touted this toll way as a way for through-traffic, especially trucks, to bypass downtown Austin congestion. Instead, trucking companies stick to I-35 because they are unable to pass the tolls on to their customers. According to Bloomberg News, the Spanish company Ferrovial, the majority owner of SH 130 Concession Company, a partnership between Spain-based Cintra and San Antonio-based Zachry American Infrastructure, had the credit rating on $1.18 billion of its bank and U.S. government debt cut to the third-lowest junk level after missing initial revenue forecasts. Moody’s Investors Service said there is a “high likelihood” of a payment default next year. These private companies are now looking to local governments to pick up the tab. www.bloomberg.com/news/2013-11-27/private-toll-road-investors-shift-revenue-risk-to-states.html. At the last WANG meeting, Bill Bunch and Roy Waley discussed a new road project proposed for the November ballot – an extension connecting SH 45 in southwest Travis County to I-35 and Onion Creek, where SH45 intersects from the east. This proposed highway project will allow Hays County commuters easy access into Austin via MoPac rather than by I-35, adding 30,000 additional cars by 2015, according to Bunch and Waley. Travis County taxpayers will pick up the tab should the project be approved by voters this fall. Rather than alleviating congestion in southwest Austin, the proposed extension, which may or may not be tolled, will clog MoPac, which is already over-burdened. Check out www.keepmopaclocal.com for more information. How does this proposal impact our neighborhood? Increased traffic on MoPac through west Austin will significantly affect our environment, elevate noise, and reduce our own mobility through the neighborhood. The proposed route cuts through the Edwards Aquifer, affecting our water supply. While the new roadway will benefit Hays County, keep in mind that Hays County residents will not be paying for the highway – Travis County taxpayers will. Another example of this attitude is the City of Kyle’s recent refusal to contribute any funding for the proposed Lone Star Rail’s station in Kyle. Kyle’s City Council unanimously approved a contract with Lone Star Rail, but failed to establish the special rail station zone required for the funding agreement, and it set the funding level at zero. Simply put, the City of Kyle wants the benefit of public transportation without paying for it. http://impactnews.com/austin-metro/san-marcos-buda-kyle/kyle-takes-first-step-toward-passenger-rail. The same is true for the proposed extension of SH 45. So, when you consider new road projects, take a look at who benefits and who will be paying for it when you cast your ballot. The buzzwords at City Hall these days seem to be “affordability” and “density.” Austin has become unaffordable for middle classes, and there has been a strong push for more affordable housing inventory throughout the City. You may remember that we even passed a bond last fall approving expenditure of funds for affordable housing – all laudable and worthy goals. Density also has its proponents. By now, you have probably heard that 750 people are moving to Austin every week (or thereabouts). Travis County and the Austin metropolitan area are one of the fastest growing regions in the State. Austin is on the cusp of becoming one of the ten fastest growing metropolitan areas in the nation, and we’re all feeling the squeeze. Changes are coming so fast that it’s hard to keep track of which new buildings are going up downtown, which new hotels are opening, and which restaurants are hot (and which have closed). So if a developer wants to grease the wheels down at City Hall for a new project, by all means, he should have “density” and “affordability” sprinkled liberally through the presentation. And if the project is on a bus line with attendant bike lanes, all the better. If he can add in some appealing marketing ploy, like providing housing for older folks (those 55 and older), he’s in like Flynn. This is what’s happened with the proposed zoning application for 3215 Exposition, formerly known as Elm Terrace. Carved out of the State School property, the developer has struck out twice at City Hall – first when he bought the property back in 2007, and then again when we went through the Neighborhood Planning process in 2010. Each time, Council was on the brink of approving SF-6 zoning when the developer pulled his application, waiting for his next opportunity. The time is now. In April, Council split 3-3 on a vote that would approve MF-2 zoning for the tract, allowing up to 34 units at the site. The structure would be massive, allowing three stories above a parking garage which would protrude out of grade at the southern end of the property. The structure as proposed would be the tallest building along Exposition (excluding some church steeples and the historical Carillon). Apparently, that’s okay with some of the Council, because high density in west Austin is just fine and the neighbors’ voice has no weight. The developer’s promise to include four affordable units sweetened the deal for the Council members voting in favor, even though this promise is unenforceable. The City cannot mandate that a developer to set aside any units as “affordable.” Instead, the developer has to voluntarily offer to do so. The affordability angle is a transparent marketing ploy used to sway Council, allowing them to tout their efforts to add affordable units all over town. Thankfully, Council members Tovo, Morrison and Martinez see through these tactics and stand with the neighborhoods. (Mayor Pro Tem Sheryl Cole was not present at the meeting and did not vote). The developer argues this case as if it’s an all or nothing deal – if he doesn’t get all 34 units he’s asking for, with a multi-family zoning designation, it means that the neighborhood and Council oppose density in west Austin. Nothing could be further from the truth. The issue is not whether the neighborhood supports densification. Instead, the question is how density should be incorporated into the fabric of the neighborhood and how development can be rationally and reasonably move forward. Allowing a high density project on a previously undeveloped tract runs counter to good development principles as well as contradicting every neighborhood plan ever submitted to the City. WANG has repeatedly reminded Council about the massive density that will be imposed on West Austin should the Brackenridge Tract and all or part of Lions Municipal Golf Course be developed by UT when the current lease expires in 2019. That’s only five years away. As proposed, possible development on the Brackenridge Tract will increase density in Tarrytown significantly, and no thought has been given to improvement of our already over-taxed infrastructure. How many portables can be added to the Casis and O’Henry campuses? How many times can we patch broken water mains? The City did not allow the neighborhood to include either the Brackenridge Tract or the current development at 3215 Exposition in the Future Land Use Map when we went through the planning process a few years ago. Rather than considering the future of the entire neighborhood over the next ten or even fifty years, Council is ready to begin development of multi-family (MF) zoning projects all along Exposition, because we need density and we need it now—wherever it can be jammed in. The specific zoning application at 3215 Exposition allowing a multi-story project on Exposition is spot zoning at its worst. By allowing this extreme density along a residential street with one-story single family homes, Council members are throwing the City’s planning principles out the window. It even runs counter to the vaunted Imagine Austin plan, which emphasizes that the character of the neighborhoods should be preserved in future development. In ten or twenty years, no one will remember the details of the labyrinthine zoning application process for the tract at 3215 Exposition. What will be remembered is the three-digit zoning designation – SF-6 or MF-2. Conditional overlays can and are regularly ignored or removed by successive Councils. Deed restrictions require vigilant enforcement by neighbors at their own cost. The zoning designation, however, is more difficult to change and signals the City’s policy toward development in the neighborhood. A case in point is the recent fight over the zoning category at 2208 Lake Austin Boulevard. The owner of the property is seeking approval for a re-zoning and amendment of the neighborhood plan over the neighborhood’s vehement objection. The City’s staff recommended the requested change, and the Planning Commission split its vote. The proposal has been forwarded to Council with no recommendation. Proponents cite increased density as justification for approving the change. Again, no consideration is given to impending increased density through potential development of the Brackenridge Tract. Because the Council’s vote was split on the proposed multi-family zoning at 3215 Exposition, the first reading of the zoning application (multi-family with 34 units, three stories above a parking garage) has been postponed until May 1. You should let Council know your thoughts on the matter – or better yet, show up and let your voice be heard. Hi folks, I am back but only as a one shot stand-in for our fine President, Cathy Kyle. She’ll be back next month with more of the information that is important to you and the neighborhood. I wanted to talk to you a little bit about coming revisions to the Land Development Code. The Code basically defines land use rules and how and what is built. It is far more complicated than that but let that suffice as a definition for the moment. The City of Austin went through a visioning process and came up with a long range plan called Imagine Austin. Some might question assumptions made in Imagine Austin as well as some of the agendas behind it. That said, it is the adopted plan for the City. For better or worse, it defines how the City will deploy its capital resources in accommodating the growth that has befallen our region. 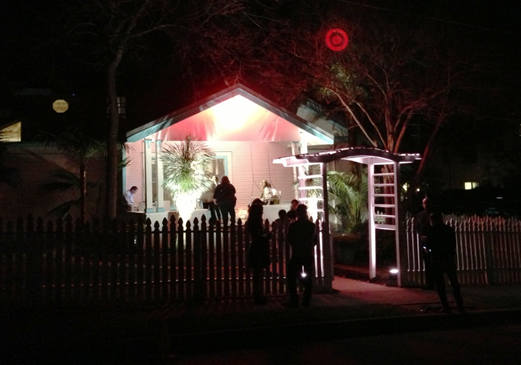 To fulfill the goals and objectives of Imagine Austin, it has been directed that a rewrite of the Code take place. That task is called CodeNext. Our current Code is overly complex and dealing with it can be expensive and time consuming. There is a real need for the Code to be simplified – but much could be done to assuage the development community without the need to strip the Code of many of the reasonable and necessary items. CodeNext staff at the City, including those in planning, and many in the development community believe that a comprehensive rewrite is necessary. They are aggressively pushing for the elimination of protections like setbacks, impervious cover limits, compatibility buffers, the McMansion ordinance and zoning categories like Single Family-3 or SF3. These critical elements combined with other aspects of the Code give us the neighborhoods that we love and that continue to make Austin such an extraordinary place. The Real Estate Council of Austin (RECA) and organizations like the Urban Land Institute Austin Chapter (comprised largely of RECA members) are actively working against these protections and other measures. A caveat here – I respect a lot of RECA members and what they do and am friends with quite a few – this is largely about issues – not people. Many of us on both sides of the issues believe that the code needs to be simplified and streamlined and that the development process at the City needs to be vastly improved. However, we happen to believe it should come at the expense of the provisions we have as a community fought for over the decades. They are using as a false premise unabated population growth as the rationale to force urban infill not only in those areas where the community has said additional density was contextually appropriate, i.e. through our neighborhood plans, but in the very heart of our stable and beloved neighborhoods like Tarrytown, Deep Eddy, Bryker Woods and Pemberton. They want to reduce minimum lot sizes and put dense development all over the central core. They further their argument by implying that this will reduce the impact of suburban sprawl. This ludicrous premise denies what has happened over the millennia. Development – sprawl – will continue to occur where land is available for development, lenders are willing to lend, builders are willing to build and buyers are willing to buy. Austin is and will be no different. That doesn’t mean that our neighborhoods need be subjected to this speculative repackaging of the failed efforts of urban renewal that doomed so many of our great cities decades ago. They further argue that it will be more cost effective for the City to resource the community with more sardines packed in the can and also that, through a variety of factors, the city can become more affordable. These again are false premises. Typically, the denser and larger the community, the more taxes are paid to support the operations of the city. Austin will be no different. You’ll hear the argument that more density will improve affordability, a highjacking of the law of supply and demand. The premise is that if you have more dwelling units than demand, rental rates and purchase prices will stay at or below equilibrium. However, barring an economic downturn, Austin cannot be at or below equilibrium because of the 100 plus folks that are moving here every day, whether we want them here or not. If population projections are correct and if we don’t run out of water, demand will always exceed supply. Thus, affordability is an unattainable paradigm. What we are left with ten, twenty or thirty years from now is a less attractive community with fewer resources. I don’t want that for Austin and I hope you don’t either. Lastly, as part of the rewrite of the Code, City staff and others are desirous of implementing what is referred to as Form Based Code. What it does, essentially, is strip the various zoning categories i.e. Single Family, Multifamily, General Office etc. of permissible and conditional uses. In other words, if it looks like a house, anything goes. The house next to you could become a retail shop, a convenience store or an office under Form Based Code. Zoning was created to separate nonconforming uses. Single family houses and duplexes would coexist, multifamily housing would be clustered in appropriate locations and retail and commercial would have their place in the community. There is great logic in this. However, what zoning did in the automobile age, was to eliminate a walkable connectedness to those services that support neighborhoods. From that perspective, there is a certain rationale to a shift to Form Based Code. However, it is not something that should be thrust on the heart of established neighborhoods like ours. Just because a building or a house looks like all the others doesn’t mean a commercial use of some form is appropriate. We have to carefully monitor the incorporation of Form Based Code by City staff to make sure that the neighborhoods’ voices are heard. So what can you do? You need to focus on several high priority items – keeping existing setbacks, minimum lot sizes, impervious cover restrictions, compatibility buffers and the McMansion ordinance as well as a preservation of what is now SF-3 zoning, which by the way allows both single family houses and duplexes. You can do this by letting your City Council and the Planning Commission know these items are very important to you. WANG is not antigrowth. WANG is for intelligent and contextually appropriate redevelopment in West Austin that will not adversely affect the quality of life we and other neighborhoods throughout Austin enjoy. Help us continue our work for you by renewing or joining at www.WestAustinNG.com. As always, our meeting are the first Monday of the month at Howson Library at 7PM. We’ll talk about CodeNext and many other important issues confronting West Austin. that is diverse and thriving. What do these projections mean for our neighborhood? The primary take-away from the NPR story was that we cannot build our way out of our traffic nightmare. We cannot add more lanes of traffic to Mopac or I35 fast enough to keep pace with the population influx. We cannot fund enough bonds fast enough to build light rail or buy new buses to solve the problem. Understand, we do need to continue to consider alternative forms of transportation, including expanding bus lines and rail and bike lanes as well as the new express lanes on MoPac (see more information on the MoPac’s progress at www.mopacexpress.com. Instead, as the cliché goes, we have to be the change. We have to adopt new habits to get around. We cannot continue to indulge in long commutes and ignore the possibility (and yes, the inconvenience and expense) of living closer to the office, of telecommuting, or god forbid, riding the bus. The moral of the NPR news story was that we have to change our own habits. I am no better than anyone else. I live four miles from my office, yet I rarely bike to work and I ride the bus (which practically stops at my front door) if my car was is the shop. When my son began driving last year, our family faced more challenges. Sometimes my family will take two cars to the same event to accommodate schedules that vary by less than a half hour. We have to change, not only because of the environment, or wastefulness, or global warming, but because of gridlock. work in light of the City Council’s new configuration following the adoption 10-1 plan, which will go into effect next year. When the Commission was drawing new voting districts, I was startled by the vehemence of neighborhoods across the City which did not want to be affiliated with West Austin in any manner. The Commission was unwilling to leave our planning area undisturbed. Instead, we have been divided into two different districts. WANG will work to convince other neighborhoods that our interests are generally aligned with the rest of the City, and we will continue to let the new Council know of the wide range of issues that are important to us. Our neighborhood continues to grow and thrive, stepping up to new challenges as they arrive. No one was surprised to learn from NPR recently that Austin’s traffic snarls have reached epic proportions. You may have thought that the MoPac construction was the cause, but no, this is a genuine phenomenon. By 2030 (that’s less than twenty years, folks), the commute from Austin to Round Rock is projected to take three hours. The news story quoted Mayor Leffingfwell as saying that this growth trajectory is nothing new — Austin has been growing at a steady rate since the 1870’s, he said. The transportation projections expose only one area in which we have failed as a city to plan for our future — to envision, design, fund and build the needed infrastructure to insure that Austin retains its vital character, remains liveable, supports a sustainable lifestyle, and continues to attract newcomers, both creative musicians and artists as well as entrepreneurs and established businesses. We need this new talent to build a city that is diverse and thriving. What do these projections mean for our neighborhood? The primary take-away from the NPR story was that we cannot build our way out of our traffic nightmare. We cannot add more lanes of traffic to Mopac or I35 fast enough to keep pace with the population influx. We cannot fund enough bonds fast enough to build light rail or buy new buses to solve the problem. Understand, we do need to continue to consider alternative forms of transportation, including expanding bus lines and rail and bike lanes as well as the new express lanes on MoPac (see more information on the MoPac’s progress at www.mopacexpress.com. Instead, as the cliché goes, we have to be the change. We have to adopt new habits to get around. We cannot continue to indulge in long commutes and ignore the possibility (and yes, the inconvenience and expense) of living closer to the office, of telecommuting, or god forbid, riding the bus. The moral of the NPR news story was that we have to change our own habits. I am no better than anyone else. I live four miles from my office, yet I rarely bike to work and I ride the bus (which practically stops at my front door) if my car was is the shop. When my son began driving last year, our family faced more challenges. Sometimes my family will take two cars to the same event to accommodate schedules that vary by less than a half hour. We have to change, not only because of the environment, or wastefulness, or global warming, but because of gridlock. WANG continues to walk a fine line between looking to the future while maintaining the character of our neighborhoods. We work with neighbors, architects, homeowners, and the City to insure that new construction and renovation efforts fit with the fabric of the neighborhood. Perhaps the greatest challenge we face is to continue our work in light of the City Council’s new configuration following the adoption 10-1 plan, which will go into effect next year. When the Commission was drawing new voting districts, I was startled by the vehemence of neighborhoods across the City which did not want to be affiliated with West Austin in any manner. The Commission was unwilling to leave our planning area undisturbed. Instead, we have been divided into two different districts. WANG will work to convince other neighborhoods that our interests are generally aligned with the rest of the City, and we will continue to let the new Council know of the wide range of issues that are important to us. Our Annual Social is fast approaching. This year it will be held on Saturday, October 19, 11 am – 1 pm. Look for signs around the neighborhood with more details. Two things are guaranteed – hamburgers from Hat Creek Burgers, and a good time. Join us and find out what’s happening around the neighborhood. Last week, with little fanfare, the Austin Independent Citizens Redistricting Commission unveiled its proposal for the district lines for the new 10-1 plan, which will divide the city into ten districts for the purpose of electing council members. The district boundaries are to (1) minimize the division of any local neighborhood or community of interest; (2) have geographically identifiable boundaries, and (3) encourage geographical compactness such that nearby areas of population are not bypassed for more distant populations. The preliminary maps approved last week neatly divide our neighborhood into two separate districts. The western half (District 7) runs from Lady Bird Lake east of MoPac, and then jumps the freeway between Windsor and 35th Street, collects Brykerwoods on its way, and continues northward all the way to Pflugerville. Pemberton, Old Enfield and Clarksville are part of District 9, which includes Barton Hills south to Ben White, Bouldin Creek, Travis Heights, Downtown, the University, and Hyde Park. Part of our neighborhood is also lumped in with Balcones Heights, Far West, Westlake, and Cedar Park (District 10). Check it out at www.austinredistricting.org/maps/interactive-preliminary-map. You can also sign up at the website to stay informed of new developments in the process. Regardless of your position on the 10-1 plan, the proposed maps fail to meet the required criteria. Our own neighborhood association is not part of one cohesive unit, many of the district lines are haphazardly drawn with no reference to geographic boundaries, and there seems to have been no effort to minimize the division of our community. It’s hard to see how our neighborhood’s interests are aligned with those of the good folks in north Austin, or how Old Enfield and Travis Heights match up. Nothing can explain the strange finger running along Pease Park, dipping down to separate Pemberton and the University. The jagged line runs along Hartford, Woodlawn, Harris and Jefferson before ending abruptly in a small triangle bounded Westover and MoPac. The proposed map does not promote compactness and links our area with distant neighborhoods. The boundaries seem intentionally drawn to divide our neighborhood and dilute our voice at City Hall. Let the Citizens Redistricting Commission know your view, and think about how our neighborhood should be incorporated into the planned districts. Another new development in our neighborhood is the latest iteration of the proposed development of 3215 Exposition, which was carved out of the Austin State Supported Living Center’s property. Steve Beuerlein with Burlington Ventures first purchased this 2.2 acre tract in May 2007. Because the property had been owned by the State, it was not zoned. In August 2007, Beuerlein went to the City Council and asked for MF-1 zoning. The neighbors strenuously opposed this intense densification of the tract, which would allow a 40’ height for new development of the property. Over 700 neighbors signed a petition asking for SF-3 zoning that was submitted to Council. SF-3 would allow either a single family residence or a duplex on the tract and conforms with the rest of the neighborhood. Instead, back in 2007, Beuerlein pushed for development of 28 units on the property. Discussions continued between Beuerlein and the neighbors and included a formal mediation. By February 14, 2008, Beuerlein and the neighbors presented a joint proposal to Council which allowed for SF-6 zoning, 20-unit development, and a height limitation of 32’. Before the third reading, however, Beuerlein withdrew the zoning application. Since that time, the project has remained dormant, and it was excepted from the neighborhood’s Future Land Use Map (FLUM), which was adopted in 2010. In that process, the neighborhood again tried to reach an agreement with the developer of the tract, but he continued to push for a multi-family designation. It should not have been a surprise then, that when Beuerlein presented his newest proposal to WANG last month, he again sought multi-family zoning and even more units – up to a whopping 32 on the 2.2 acre tract. Beuerlein argues that the development will provide affordable housing to seniors. He promises to sell only to those 55 and older, and 1-bedroom units will start at $450,000.00. Three-bedroom units will sell for $1.5 million. Maybe that’s affordable to some folks, and I guess that 55 qualifies as “senior”. What are the neighbors’ objections to the development? There are several, and it’s hard to choose which is the most important. We are concerned with the precedent of allowing density of the magnitude proposed along Exposition. Over the years, WANG has fought to protect single-family development along Exposition with the exception of a few commercial centers, churches and schools. We included this vision of the future development along this corridor in the FLUM. Unless we continue to oppose proposed increased density, we can expect Exposition to look like Enfield between MoPac and Lamar. Instead, new projects along Enfield should make some attempt to be compatible with the surrounding property. WANG has a history of working with development to insure that all the stakeholders are satisfied. For example, WANG was deeply involved in the expansion of Good Shepherd Episcopal’s campus as well as Westminster Presbyterian’s new construction. The neighborhood across the street from the Beuerlein tract is limited by deed restriction to single-story single family homes (fair disclosure: I live in that neighborhood), and Tarrytown averages about three units/acre, not 32. We’re also worried about three story condominiums looming over nearby houses, as well as increased traffic along an already congested thoroughfare. Also troubling is the hard work many neighbors put in to the last zoning application, only to be sent back to square one with the new, even denser, proposition. Another consideration is environmental: the tract sits on the headwaters of Taylor Slough, a critical watershed supplying water to Lake Austin. Beuerlein should attempt to work with the neighbors instead of continually pushing for more and more units in a zombie development. It’s the dog days of summer. Neighbors are either launching into the new school year, or are leaving town for the last chance to escape the unrelenting heat. As usual, the summer seems too short, and this summer seems to have sped by more quickly than ever. We’re all looking forward to cooler temps coming soon, and plans are well underway for our Annual Picnic, scheduled for October 19, 2013. More details to come, but I’m pretty sure a hamburger truck will be part of the festivities. It’s a great opportunity to re-connect with old friends and to welcome new folks to the neighborhood. Things have been hopping in the ‘hood this summer. The Fourth of July parade was a resounding success, raising several thousand dollars benefitting local parks. Of course, the huge turnout — your participation — made this event successful and will insure that it will continue to grow and prosper. The Austin Girls School construction project is well underway, and the girls will be in their new digs by February 2014. We have continued to monitor the project to be sure that the project’s intrusion into neighborhood life is kept to a minimum. The MoPac improvements are also continuing on schedule. Sound wall construction will begin at the north end of the project and will move gradually southward toward our neighborhood. We’ve also been keeping track of changes at Tarrytown Shopping Center. She Who Will Remain Nameless continues her efforts to impose an agenda on our neighborhood from afar. After lengthy negotiations, Austin Java opened there last fall, and it’s been nice to have a real restaurant in the neighborhood (RIP Holiday House). We’ve noted that they’ve reduced their hours lately, so it’s uncertain how long the local business will be able to retain a foothold here. You’ve probably also seen the significant expansion of Austin Pets Alive’s space, taking over all of Broaddus Chevron’s former space. The outdoor area has been enclosed with welded wire fencing and a hardscape installed. This expansion and construction has raised lots of questions from neighbors. We’re told that the expanded facility will house only cats and not dogs, and none of the animals will be kept outside — there will be no outdoor kennels. If all of the services remain inside the building, then the business should be classified as “pet services” and no zoning variance is required. We’ll continue to keep track of these changes to be sure that the use of the property conforms to zoning requirements. Our upcoming September meeting will be held on the second Monday September 9 due to the Labor Day holiday on September 2. We’ll be meeting at our regular time and place (7:00 – 9:00PM at the the LIONS MUNICIPAL GOLF COURSE CLUBHOUSE). At our meeting last month, WANG unanimously passed a resolution asking the City to increase funding for the Parks and Recreation Department. The supplemental appropriation will help close the parks funding gap that has steadily increased over recent decades and will give us the “Great Austin Parks” that our community deserves. The PARD budget has been cut repeatedly for decades during economic downturns. Such cuts never seem to get restored when the economy recovers yet the need grows. We asked that part of this funding increase include $1 million for the Aquatics Division to keep our pools open all summer. Presently, pools open in the second week of June and close in late August (except for the handful of pools that remain open year-round: Barton Springs, Deep Eddy, Big Stacy). Even in summer, many of the pools do not open until late afternoon during the week and are closed at least one day each week. My son is holding down his first job this summer – as a lifeguard for the City’s Aquatics Department. His involvement with the program has given me a new level of respect for the City’s pools and the lifeguards who serve there. Before taking the stand as a lifeguard, each applicant must complete a rigorous certification course, pass a City Skills test, and complete an in-service program. Lifeguards working at Barton Springs must complete an even more rigorous program. Altogether, the City’s training program instills in the lifeguarding staff a healthy respect for the importance of the work they do. In addition to having first aid and CPR training, lifeguards also watch for horseplay, stop kids from running at the pool’s edge, and pick up trash. There’s even an art to blowing the whistle every hour to give kids (and parents) a much-needed breather. At most pools, the lifeguards take the stand for 20 minutes at a time, so that they are able to remain alert. We are lucky to have several great pools in our neighborhood. The grand dame, of course, is Deep Eddy Pool. Listed on the National Register of Historic Places, Deep Eddy is the oldest swimming pool in Texas, and is still spring-fed from a 65 ft. hand-dug well – meaning no chlorine. Even before the pool was built in 1914, locals swam in an eddy formed by a large boulder in the Colorado River where cold springs surfaced. 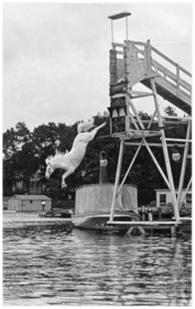 In the early days, the pool was the feature of a resort on the banks on the Colorado, and featured attractions such as a diving horse. Really. 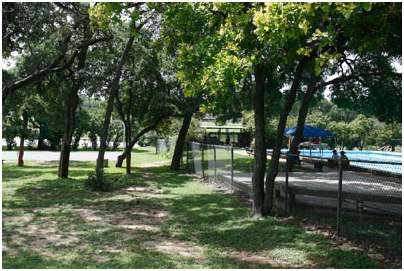 Deep Eddy Pool has been a City park since 1935. 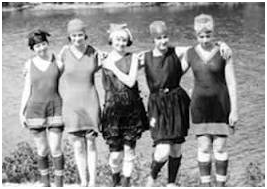 Following a flood that year, the WPA re-built the bathhouse and re-opened the pool the following year. It has remained open ever since. The Friends of Deep Eddy Pool and the City completed a massive restoration of the bathhouse in 2007. The pool remains a great gathering place for the community – especially in the summer, when it hosts Deep Eddy Movie Nights, which will continue this year through August 3. Learn more about Deep Eddy at austintexas.gov/department/deep-eddy-pool and at deepeddy.org. westenfieldpoolimprovements.pdf. In the meantime, you can enjoy the shaded pool for the rest of the summer. The pool at Reed Park is tucked in the back of this small neighborhood park. The separate kiddie pool makes it a great option for families with babies and toddlers. Its easy accessibility also makes it a great option for an evening picnic and swim at the end of a hot Texas summer day. The wading pool at West Austin Park in Clarksville offers similar amenities — plenty of shade trees, a playscape, easy parking and even an off-leash area for your dog. Where ever you are and whatever your schedule, there are plenty of opportunities for a quick dip close to home. I hope you are enjoying your summer and that you take advantage of our neighborhood pools. If you’re so inclined, let the City Council know that you support additional funding for our parks (and pools). 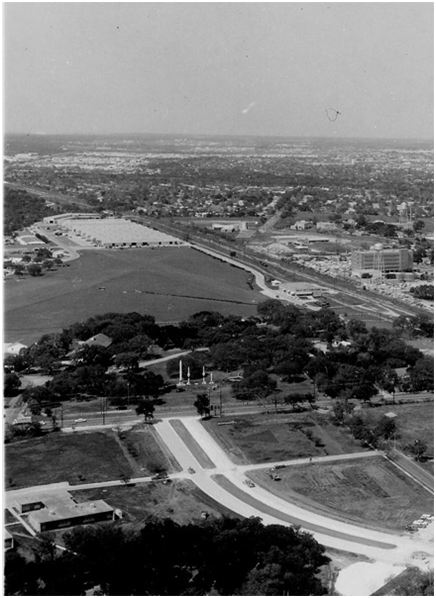 Aerial view of Camp Mabry and the State Assisted Living Center (looking north) before construction of MoPac, 1964. You may have noticed drilling rigs set up alongside MoPac in recent weeks. These drilling rigs are the first visible evidence of the Mopac Improvement Project. This project has been an integral component of Capital Area Metropolitan Planning Organization’s (CAMPO) long range master plan. The Central Texas Regional Mobility Authority is leading the project in coordination with TxDOT, the City of Austin, and Capital Metro. An environmental study (NEPA) of the corridor was completed in 2012, and construction of express lanes is slated to begin this fall. At the moment, core samples are being taken to provide information about the geological underpinnings of the highway (hence the drilling rigs). You will see painted marks interspersed along the shoulder, showing where core samples have been taken. The contractors are also testing vibration levels to mitigate any impact on adjacent structures. The improvement project includes sound walls and managed lanes, also known express lanes, and use variable rate tolling to maintain optimal traffic speeds through the corridor. Managed lanes were first included in the long-range plan for MoPac in 1994. Successful examples may be found throughout the U.S. but this is Austin’s first exposure to this type of traffic management. The project is intended to address mobility and the movement of traffic within the region — not necessarily capacity. Since 2000, traffic on MoPac has increased by 33,000 trips per day and is moving ever closer to a daily count of 200,000. Multimodality, that is, essentially all modes of transit, is an essential component of the project. Consequently, $5 million is allocated to bicycle and pedestrian improvements. Significant bicycle and pedestrian improvements have been emphasized at key intersections in our neighborhood (Enfield, Windsor, Westover/Northwood and Perry/45th), although these plans are not final. These proposals aim to improve east-west connectivity across the corridor. The first significant improvement to MoPac will be the construction of sound walls. Under federal rules, only residential property owners adjacent to MoPac were given the opportunity to vote on whether sound walls that would be included along sections of the highway. Not surprisingly, most owners in our neighborhoods voted in favor of sound walls. The walls will stretch along the east side of MoPac from 5th Street to Anderson Lane, except for the area next to TxDOT’s facilities at 35th Street, Westminster Manor and the Gables Apartments and a portion of Allendale. Along the west, the sound walls will run from north of Westenfield Park to West 35th Street, and then from Perry Lane/45th Street to just past Hancock. You can find detailed maps of the location of sound walls at mopacexpress.com/environmental/Sound%20Wall%20Maps.pdf and a list at mopacexpress.com/environmental/Sound%20Wall%20List.pdf. The sound walls will be constructed of modular concrete, but aesthetics do enter into the equation. The CTRMA’s community Aesthetic Advisory Committee voted against the ubiquitous monolithic pebbled surface seen elsewhere. A great deal of thought was incorporated in the final design to make it as appealing as modular concrete can be. The only major change from the original plans concerns the 5th Street exit. Originally, the exit was designed as a flyover from MoPac to eastbound 5th Street. The design/build firm, CH2M Hill, has reconfigured the design of that intersection so that the exit will go underneath the highway rather than over it. Going under is easier from a construction perspective and ameliorates cost concerns. Some neighbors were concerned about the height of the flyover; going under will resolve those issues as well. The project is funded by state and federal resources. Because this project was “shovel ready,” it was moved up in priority over projects in other cities which were still in the design stage. Even so, the project will not be complete until well into 2015, although the construction schedule will not be finalized for the next couple of months. As CH2M Hill finalizes the schedule, they will determine where construction will begin and will begin the process of engaging and informing the neighbors in close cooperation with CTRMA. These improvements are harbingers of significant changes for our neighborhood. The sound walls and the managed lanes should reduce the impact of having a major highway cutting through our area. Stay tuned for more information about the construction schedule and more community information meetings. I was disappointed to read in this morning’s paper that the Texas House has voted down an amendment that would have required public-private development projects on state land to be subject to local zoning. Sen. Kirk Watson has sponsored a similar bill in the Texas Senate, and it’s still breathing – for now. But Gov. Perry opposes the notion that commercial development on state land should comply with local land use ordinances and urged that the legislation be removed from the bills under consideration. Terry Keel actively lobbied against the amendment, too. As State Rep. Harold Dutton explained, “The state ought to have the absolute, unfettered right to move forward with a project that the state deems appropriate and necessary to conduct state business.” Ah yes, it’s good to be King — especially when the “state business” is lining the pockets of private commerce. After all, a “public-private development” turns a profit for private companies and their stockholders. These developments may or may not ultimately relieve the taxpayers’ burden. Why, you may ask, is this a neighborhood issue? While it’s true that legislation bringing public-private development in line with local ordinances would have a state-wide effect, perhaps it’s greatest impact is here at home. Think about all of the state land within Austin’s city limits, and even within our neighborhood – the Austin State Supported Living Center (formerly the Austin State School), Lions Municipal Golf Course and the Breckenridge tract come immediately to mind. As a neighborhood, we spent long hours and several years developing a Future Land Use Map (FLUM) identifying development corridors and densification in our neighborhood. Without having to comply with local ordinances and ignoring the FLUM, development of state-owned lands could significantly undermine our neighborhood’s efforts. As hard as we work to maintain the integrity and livability of our neighborhood, unregulated public-private developments may negate our work. In addition, these unfettered developments operate at a distinct advantage over private developments which still have to follow the rules. This last tactic seems like yet another legislative swipe at the City of Austin. I always breathe a sigh of relief when the Legislature leaves town. The last thirty days of this session can’t come too soon. It’s raining this morning, a pretty rare event in Austin these days. I remember when it rained often. My books would mildew; my hair curled; the humidity and the damp invaded everything. The city was covered in green. Moss, mushrooms, the heavy scent of flowers in the spring permeated the air. But lately, it’s felt a little more like El Paso. Or – dare I say it – Phoenix. We still have not recovered from the awful, scorching drought of 2011. Lake levels remain low, and we have been on water rationing through the winter (we’re still under Stage 2 watering restrictions — austintexas.gov/department/stage-2-watering-restrictions). According to the LCRA, even the three inches of rain we received in early April barely put a dent in the severe drought gripping Austin and the Lower Colorado River basin. Today, we’ve registered less than an inch – barely enough to settle the dust, as my grandmother would say. The drought in the local area remains “severe” to “extreme.” Lake Travis and Lake Buchannan – that’s our water supply, folks – are only 40% full. Earlier this year, the LCRA requested emergency relief for commercial and industrial customers, and these measures went into effect on March 1. More and more neighbors are installing rainwater collection systems. Some cities have promoted the use of gray water (from your shower, laundry and sink) for irrigating the lawn. My husband grew up in California during a long drought, and he has shamed me into turning off the faucet while washing dishes and brushing my teeth. So, there are conservation efforts we can take while we’re prayin’ for rain. One significant casualty of the prolonged drought has been the loss of trees, or as city planners like to say, losing our urban forest. I like the image of an urban forest. The greenbelt behind Reed Park, hiking trails behind Mayfield Park, and the trails along Johnson Creek all remind me of what Austin must have looked like before the glass, steel, cement and asphalt took over, like an unwieldy kudzu vine. These areas perhaps are the closest I’ll ever be to an “old-growth” forest, at least locally. So, how many trees have you lost to the drought so far? We lost a crape myrtle and a magnolia. The year before the drought, a 50-foot cedar elm blew over in a storm. I expect that the tree was planted when my house was built, making it about 60 years old. Many cedar elms in our neighborhood are reaching the end of their span. Suddenly, I had full sun in my backyard, completely changing my planting strategy – which now includes lots of drought-tolerant plants that can also withstand our searing summers. To combat the loss of trees, plant more! A few years ago, I got a free Arizona ash from the Texas Forestry Association. When the Legislature is in session, the TFA gives away hardwood seedlings at the Capitol to raise public awareness of the tree planting efforts that take place across the state (alas, this year’s event was on March 6). My seedling is now over 20 feet tall. Losing the cedar elm gave me some flexibility, too. In its place, I planted a goldenball leadtree, a native of the Edwards plateau, as well as three possumhaw hollies. This year, we’ve planted a Texas ash, a persimmon tree and three live oaks. Take care with live oaks, however, because of their susceptibility to oak wilt. The City also recognizes the importance of trees. Austin’s Tree and Natural Preservation Area ordinance notes, “the urban forest has social, ecological, cultural, economic, historical, and aesthetic benefits for the citizens of Austin…[and] enhances the health and welfare of the citizens of Austin.” According to the ordinance, trees with a diameter of 8”, or 19” on residential property, are protected. Protected trees require a permit from the City before they can be removed. In 2010, the City Council took further action by adopting the Heritage Tree categories. Heritage trees can now only be removed if granted a waiver by the director of the Planning and Development Review Department; that waiver can only be granted if the applicant has already been denied other variances that would eliminate the need for the tree’s removal, or if removal would result in “maximum ecological service” or “cultural value” from the trees preserved. And if the tree in question is larger than 30 inches in diameter, it gets even harder: The same conditions still apply, but it would require a hearing before and permission from the city’s Land Use Commission. If you have any questions about tree removal, contact cityarborist@austintexas.gov, or visit the website at austintexas.gov/department/city-arborist. According to the Austin Heritage Tree Foundation, even established trees require watering during severe drought conditions. Established treed need to be watered slowly and deeply, for about 90-120 minutes every three weeks, or every 2 weeks when the temperatures range above 90ºF (which will be any day now). Young trees, one to three years old, need to be watered twice weekly for about 10 minutes until well-established. This schedule of watering is permissible under the current watering restrictions. For more information on caring for new and established trees, check out the Heritage Tree Foundation’s website, austinheritagetreefoundation.com. 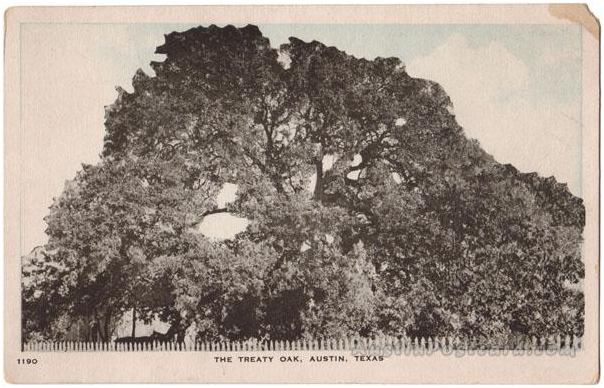 I found this old postcard of Treaty Oak, and it speaks to me as a symbol of our urban forest. This is what we once had. Treaty Oak is the last remaining of a grove of 14 oak trees that made up the Council of Oaks, a sacred meeting place for the Comanche and Kiowa peoples. The size of the tree is breathtaking; arborists estimate it to be over 500 years old. In 1989, it very nearly died following a bizarre act of vandalism, but through careful and vigilant efforts, Treaty Oak continues to recover. In 1997, it produced the first acorns since the attack. As with our remaining urban forest, we can continue to preserve what we have and replace what we’ve lost. Westenfield Park sits on eleven acres on the northwest corner of Enfield and MoPac. It offers tennis courts, basketball courts, a playscape, and multipurpose grounds – we’ve used the park for team practices for soccer and baseball when my sons played on WAYA teams. Now, we mostly use the park as an access to the Johnson Creek hike and bike trail, which provides easy and safe access to downtown and Lady Bird Lake. Cycling along Johnson Creek provides a welcome retreat from urban noise and traffic. I am always amazed that the green space exists in the heart of central Austin. Within seconds from MoPac, you can be enveloped in the natural world. Without doubt, one of the best features of Westenfield Park is its pool. Incredibly, the pool has been in operation at that location since 1933, and it’s usually packed in the summer. When the pool opens this summer, treat yourself to a dip in its shaded waters. It’s also a great pool for parents and kids to congregate, with parents lining the pool to catch up with neighbors and keep an eye on their children. Now that the reconstruction of Deep Eddy Pool has been completed, the City of Austin has begun to focus on our other neighborhood pools. Since January, the City has been making repairs to Reed Pool. Work is to be completed in April so it is expected to open on schedule this season. Westenfield Pool, much like Deep Eddy, is in need of a complete overhaul. Constructed 80 years ago, the pool has serious irreparable structural issues. It was to have been rebuilt after the 2012 swimming season but bond funds were diverted to Deep Eddy and Bartholomew Pools. With the approval of bonds in November, funds are available and have been allocated to rebuild Westenfield beginning in September for an opening in 2014. There was some concern that it wouldn’t be open this season due to some of the pool’s plumbing. However, City Acquatics staff were able to repair it and we are delighted to report that the pool will be open for what promises to be a very hot and dry summer. With the way this spring is shaping up, the pools can’t open soon enough! Every couple of years, the Legislature descends on Austin. While the Legislators provide an economic boon to the City, at times it seems that the Legislature is intent upon making Austin more, well, like the rest of the State. For example, State Representative Drew Springer filed HB 2416, the “Shopping Bag Freedom Act,” only a few days after Austin’s municipal ordinance banning single use bags went into effect. Springer hails from Muenster, population 1,543, and only 15 miles south of the Oklahoma border. He claims that everyone he’s spoken to opposes the ban. That has not been my experience, and I wonder how many residents he has polled. Regardless, it seems that regulation of local matters, such as single-use bags, should be decided by the City, not by the Legislature. After all, no one’s imposing a bag ban on the good citizens of Muenster. Of similar interest is the development of state-owned property. We spent several years creating a Neighborhood Plan which provides guidance for land use and zoning within our neighborhood. On a larger scale, the City has adopted several ordinances to protect the livability of our City, including the Heritage Tree Ordinance, the McMansion ordinance, Great Streets requirements, the Imagine Austin Comprehensive Plan, the water quality protection measures, historic preservation measures, and Town Lake Corridor protections, which affect lot coverage, building sizes, and lot sizes, open space regulations, and park dedication requirements. However, when the State develops the property it owns, it is presently exempt from local zoning and ordinances — that’s the rule in Austin as well as any other city with State-owned land within its limits. This also applies when the State sells off parcels of land – suddenly, a tract of land within the city limits with private ownership has no governing zoning since there was none attached to the property when it was held by the State. This means that when the State decides to develop property for commercial use, the tract is not subject to local land use laws. To address this issue, State Senators Kirk Watson and Kevin Eltife have proposed SB 507, which would require that qualifying projects performed or located in a municipality must comply with the zoning and land use regulations of the municipality. The bill is designed to reform public-private partnerships to increase transparency and accountability. Not only is no significant fiscal implication to the State anticipated, but the bill aims to ensure that the state gets the best deal on public-private initiatives. It’s nice when the Legislature works for us. This is the perfect time of year to get outside, and there are plenty of places in town to soak up some sun (never mind that summer’s coming). The bright red flowers of japonica are in bloom and the mountain laurel’s brief purple flowers are coming out. You won’t have to go far – Reed Park is just around the corner. The park itself is six acres with a playscape, swings, a kid-friendly pool in the summer, and a natural preserve. It is a great gathering place. Over the years, I’ve attended (and hosted) birthday parties, neighborhood picnics, the incomparable Tarry town July 4th Parade, baseball and softball practices, Easter egg hunts, and end-of the school year celebrations. The park is not only for parties, though. We walk to the park almost weekly with our dogs, and more often than not, I run into someone I know from the neighborhood. These are worrisome times for the park, however. Recent measurements of the amount of pollution in Taylor Slough South, which runs through Reed Park, revealed that contaminant levels are high. The Texas Commission on Environmental Quality is working with stakeholders to develop a citizen-based plan to reduce bacteria levels in Taylor Slough South along with three other Austin streams. The goal of the project is to reduce bacteria levels to protect people who swim or wade in the creeks. For more information on the pollution levels at Taylor Slough South, go to austintexas.gov/sites/default/files/files/Watershed/eii/TaylorSloughS_EII_ph2_2010.pdf. Another aspect of caring for Reed Park falls within the purview of Watershed Protection programs operated by the City’s Parks and Recreation Department. With oversight by Mateo Scoggins, trees have been planted along Taylor Slough to improve the streambanks and reduce erosion. Aside from its natural beauty, an interesting feature of the park is a large brick structure which long predates the park. 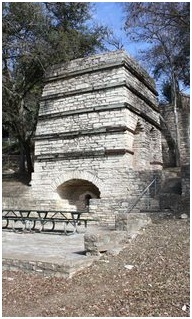 The kiln, built in 1871 was used to melt limestone into lime, which was then mixed with other ingredients to make mortar. The stone was quarried in Taylor Slough. At its peak production, the kiln produced 50,000 barrels of lime each year. The kiln ceased operations soon about 1895 after the owner’s death. The land on which the park sits was donated to the City in 1954 by Mrs. Fagan Dickson. She put no conditions on the gift, but told the Austin Statesman: “If the council sees fit, we’d like the park named for our little girls.” Reed Park honors her daughters, Roberta and Lucy Reed, who were both teenagers at the time. I first discovered Mayfield Park when my boys were little. My sister had set up a photo shoot with a posh photographer to take pictures of my children and hers for our mother. What a delight! The natural light filtered through the trees, the low walls forming a perfect backdrop, the coy ponds to avoid at all cost, the call of the peacocks…those are still some of my favorite pictures. The part became a family favorite – one of my sisters had her bridal portrait made there. More recently, my family took a hike over the holidays to explore the paths the wind through the woods behind the park, one more secret getaway. Every time I go, I am astounded that such an oasis of peace and greenery remains unseen within our busy town. It truly is a hidden gem. I’ve often wondered about the cottage forming the centerpiece of the park. The home and surrounding 23 acres were purchased by Allison Mayfield in 1909 as a summer retreat. The home stayed in the family, and Mayfield’s daughter, Mary Mayfield Gutsch donated the property to the City in 1971 to be used as a park. The Mayfields and the Gutsches can claim honors for the unique design of the park, along with input and help from Steve Arredondo, the resident gardener for many years. Mary Gutsch’s husband, Milton, directed the building of the stone walls, ponds, and garden features, emulating an English cottage garden. Today, the gardens are filled with heirloom plants and the unusual Sabal Mexicana Palms, transplanted from the Rio Grande Valley in the ‘30’s. And the peacocks? They were gifts from friends in 1935, and the descendants of the same birds make their home in the park today. The park encourages community involvement. The Mayfield Council, a volunteer group, is dedicated to restoring and improving the park, working closely with Austin Parks and Recreation Department. Plans for the park include restoration of the cottage and of the gardens. Also, garden plots are available for families or other groups interested in contributing their gardening talents. The preserve behind the cottage is the focus of Friends of Mayfield Preserve, a group of volunteers devoted to maintaining the natural beauty of the 21 acre preserve. A favorite event is the annual fundraiser, Trowel & Error, to be held April 6, 2013. There’s still time to sign on as a sponsor, but at the very least, mark your calendars to stop by the park that day. In addition to a plant sale, there will be speakers addressing organic weed control, cultivating culinary herbs, and color combinations with perennials which tolerate shade. As my family has grown older, we use the park differently, no longer posing for photos by the old stone walls. Now, we’re more likely to spend a couple of hours exploring the preserve to its very limits. Whatever your interest, you will find Mayfield Park worth your time and your support. We’re so lucky to have it as part of our neighborhood. I know it’s a cliché, but this is my favorite time of year. I drive my family over the brink by listening only to Christmas carols, watching the same Christmas movies each year, and I take it as a personal failure that my Christmas tree, although real, is still barren of lights and ornaments. I do manage to avoid the malls and the spending frenzy, opting for homemade gifts, charitable giving, and making purchases at local merchants. Still – there was something magic about standing in front of the old Marshall Fields’ window inChicagoearlier this month to watch the automated displays of toy trains, elves, and Santa himself. Another part of the holidays that I love is to drive through our neighborhood to check out the decorations – especially the lights. While our display is modest – one string of white lights along the eaves (and I will not admit how long those lights have been attached to our gutter), I am always amazed and impressed by the beautiful decorations on your homes, demonstrating not only your creativity but a lot of hard work. And we at WANG have been hard at work as well. Each month, we weigh in on requests for zoning changes that go before City commissions. Many thanks to Blake Tollett for his tireless efforts on that front. We also represent the neighbors’ concerns for just about every building project in the neighborhood, from the expansion of the Good Shepherd campus to the re-design of the Austin Girls’ School. You may have heard that the Legislature will be re-convening in January, and with that arrival come new challenges. There have been rumblings of selling off state property, or even leasing it, to generate revenue – and some of that property is in our neighborhood. So, there is every reason to continue your support of WANG as we work to convey your interests to City Council, the Board of Adjustment, our state representatives, and the University. This season reminds me of the many things I have to be grateful for, not the least of which are WANG’s incredibly talented board members and the terrific folks in our neighborhood.